Dolls have been a part of human culture for hundreds of years. While early dolls were made of materials such as wood, clay or wax, porcelain became a popular material to use in doll construction in the 19th century. The Chinese and the French began making china heads for dolls in the 1840s. In 1880, the French popularized the "bebe,” which was one of the first dolls made to represent a child. Though beautiful, porcelain dolls are fragile and need to be repaired from time to time. Remove the doll's garments when attaching a new head, hands or feet. Most of these parts are attached by a strong thread or string. Snip the string that connects the broken part to the doll's body and pull it away from the doll's soft core. Thread your needle with strong thread and pull it through one of the attachment holes on the new head, hands or feet. Try to find the original holes in the doll's body where these limbs were attached. This is an easy way to ensure that the new head, hands or feet are not lopsided. Securely stitch the different parts into those spots. Use craft glue to repair individual parts or a doll that is made entirely of porcelain. Squeeze a tiny amount of glue onto a small paint brush. Brush the glue onto the edges of the pieces that need to be bonded. Gently but firmly push the pieces together. Allow the parts to dry for at least 24 hours or as instructed by the glue manufacturer. Revitalize bald or patchy-haired dolls with a new doll wig. Trim hair on the doll's head with scissors so that the doll is nearly hairless. Squeeze craft glue onto a small paint brush and coat the doll's head until it is completely covered. Starting at the crown, place the wig on the doll's head and then pull down toward the nape of the neck. Gently pat it into place, adjusting as needed. 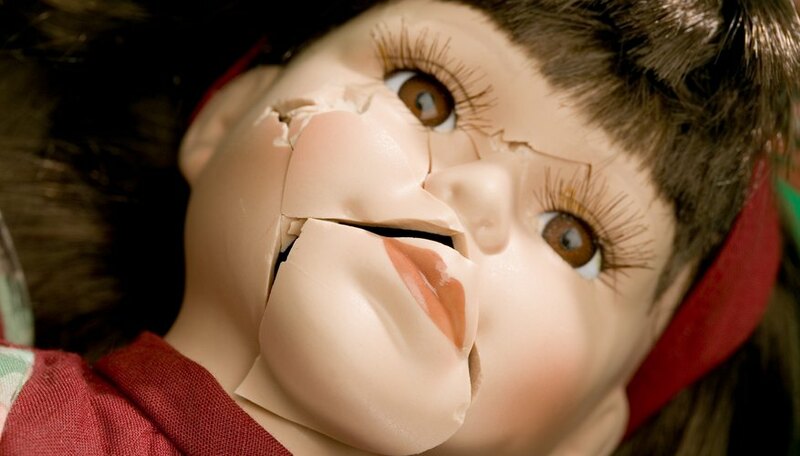 Take collectible or antique dolls to a professional doll repair shop for repairs. Use craft glue that specifically bonds porcelain.